Arrive into Split or Zadar airport. 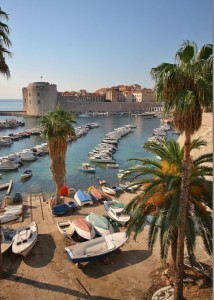 Depart from Dubrovnik airport and pick up a rental car to begin your holiday. Northern Dalmatia: Stay at one of our coastal properties in the Split region which offer an ideal base from which to explore highlights such as the UNESCO towns of Split, Trogir and Sibenik as well as the waterfall and lakes park at Krka. Shop at the stunning outdoor markets bursting with organically grown seasonal produce, take yourself on a day trip to one of the offshore islands such as Kornati, Brac, Hvar and Pakleni islands. Southern Dalmatia: At the end of your stay in Northern Dalmatia, drive back to Dubrovnik region located in Southern Dalmatia and stay at one of our recommended properties. You can choose either one of the popular cities of Cavtat or Dubrovnik and live amongst the locals in historic city centres, or stay outside at one of our cottages/villas located in the smaller villages where you can enjoy a stroll to the beaches or local Konoba (Croatian taverna). Day trips to Brac island are possible to organise yourself when staying in Northern Dalmatia region. Just head on down to Split ferry terminal, hop on the car ferry to Supetar on Brac island (45 minute crossing) and you can spend all day on Brac island under your own steam where you can visit delightful harbour towns, hidden konobas (Croatian tavernas) and crystal clear waters including the famous beach at Zlatni Rat in Bol. On the journey down to Dubrovnik from Split region why not consider taking a diversion into Bosnia. From the main coastal road down to Dubrovnik, take the exit towards Mostar and in less than an hour you can be in this stunning city. Spend a few hours exploring the cobbled streets of the fascinating Old Town with its’ famous Ottoman bridge, reconstructed in 2004. Explore both ends of the Stari Most (Old Bridge) browsing the many boutiques, market stalls selling Turkish carpets and brass ornaments and cafes lining the Neretva river. Daytrips available from Dubrovnik by car worth considering are a visit to the Arboretum at Trsteno, a three island boat trip and a day trip to neighbouring Montenegro. There are 222 species of birds to be found at the Krka National Park, including numerous carnivorous birds such as the Osprey and Golden Eagle, making it one of the most valuable ornithological areas in Europe.